1 Preheat the oven to 190°C, gas mark 5. Arrange the apricot halves, cut side up in a small gratin dish or roasting tin, and spoon a little wine over each one, then sprinkle with the sugar. 2 Bake for 15-20 minutes, depending on the ripeness of the apricots. They should be tender but not falling apart. Allow to cool (they can be eaten warm or at room temperature). 3 Divide the apricots between 6 plates and dot nuggets of the curd among them. 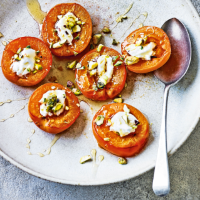 Drizzle the apricots and curd with a little honey and scatter with the pistachios.